The Winston Wildcats came to town with a plan. While they were beaten at home the previous week by our undefeated SteelHawks; the opportunity to play them again so soon led them to believe they had a real opportunity for victory. Yeah, they even guaranteed it! I wrote in my game preview that I thought it would be a “kitchen sink” game for the young Wildcats–that they’d throw all manner of trick plays, gimmicks, hail marys and hay-makers at the undefeated SteelHawks. I admit, it had me a bit worried going into the game–hard to play a team with nothing to lose. Then, the Wildcats got punched in the mouth. Hard. The SteelHawks smothering defense didn’t allow the Wildcats to even attempt any trickeration. At least not that I could tell. They were running for their lives, and giving the ball away. 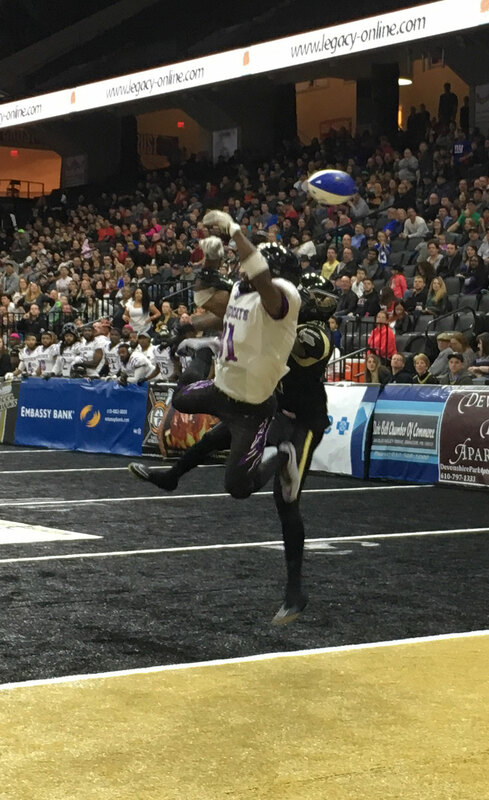 The SteelHawks recorded 8 interceptions in the game–to go with two fumble recoveries! The SteelHawks weren’t just taking the ball away–the defense was putting up scores themselves. The 72-8 thrashing has the team still undefeated (4-0, 5-0 overall) headed into a showdown with Philadelphia on Saturday, April 26 at the PPL Center in Allentown. The ‘Hawks will be off this week to prepare, while the 2-0 YellowJackets will have to deal with the Penn Capitals. While that game will be more of a test, right now the defensive staff and players are operating at a new level. Can they keep it up? What will Philly need to do to beat them? We’ll let you know, in the next ‘SteelHawks Game Day’ post! 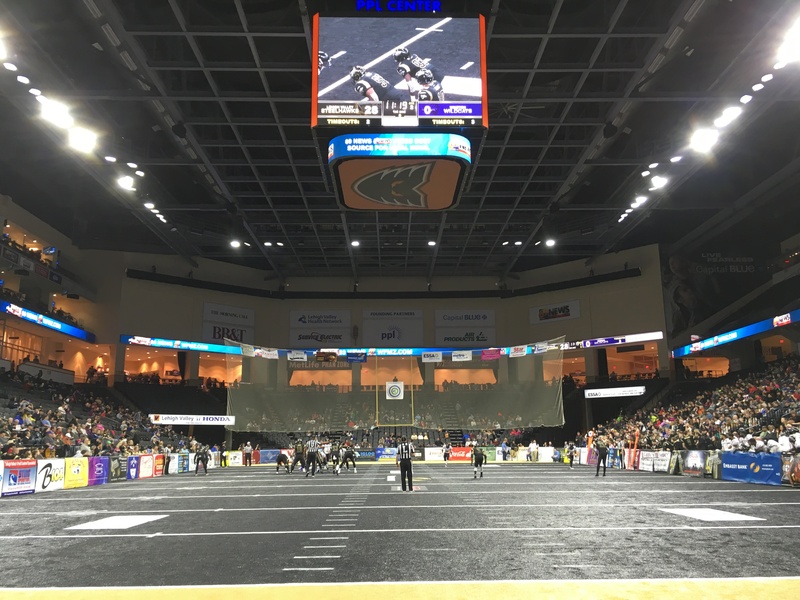 Allentown, PA: Lehigh Valley Steelhawks (4-0) dominated both sides of ball in their one-sided victory over the Winston Wildcats (0-4), 72-8 this Friday night. In an almost shutout, the defense recorded ten turnovers in the lopsided game. In what was a one-sided game the entire way, the Steelhawks defense continued to shine. They held Winston’s offense scoreless until under a minute left in the game and forced ten total turnovers (Eight Interceptions, two fumble recoveries). The offense started the first quarter off with a bang when QB Jake Jablonski (14 of 20, 151 yds, 4 tds, 2 ints, 1 rushing td) found WR Brandon Renford (3 catches, 43 yds, 2 tds) for a 30 yard touchdown pass on the first offensive play of the game. The defense quickly got Lehigh Valley the ball back on a James Pitts interception (3 tackles, 1tfl, 2 ints). WR Jerrell Young, the team’s leading receiver on the day with 10 catches for 89 yards and 1 td, would be on the receiving end of the touchdown pass to complete the drive. But the ’Hawks weren’t done yet. The defense would record two more touchdowns in the quarter; a fumble recovery in the endzone by LB Tim Hume, and a pick six by LB Lenroy Neysmith (2 tackles, .5 tfl, 3 ints) would bring the score to 28-0 at the end of the first quarter. The Wildcats were able to slow the Steelhawks down a bit in the second quarter, only giving up two touchdowns. After halftime, the Steelhawks picked up where the left off. The offense got into the endzone four more times – Renford picking up another score, WR Darius Prince (4 catches for 38 yds, 2 tds) got his second on the night and the first of QB Clay Belton’s two, DL/FB Gerard Bryant got the team’s first non-qb rushing touchdown on the year. Also marked on the score sheet was a K Spencer Hotaling deuce (his 2nd), and a defensive safety. The 24 point third quarter brought the score to 65-0. The scoring cooled off in the fourth, with Winston sustaining a long drive until Lehigh Valley’s defense got another take-away, and the Steelhawks tacked on a Greg Edwards (6 catches for 50 yds, 1 td) touchdown catch. The Wildcats would end the shutout when QB Torrie Walker (3 of 12, 1 td, 3 ints) found WR Antwan Thorpe (6 catches for 57 yds, 1 td) on a 20 yard pass over the top. At the final whistle, the score stood: Lehigh Valley 71, Winston 8. Lehigh Valley outgained the Wildcats 267 to 98 total offensive yards. In addition to ten turnovers forced, the defense recorded two touchdowns, and scored 14 points. Of the teams eight interceptions, they were returned for 102 yards total. 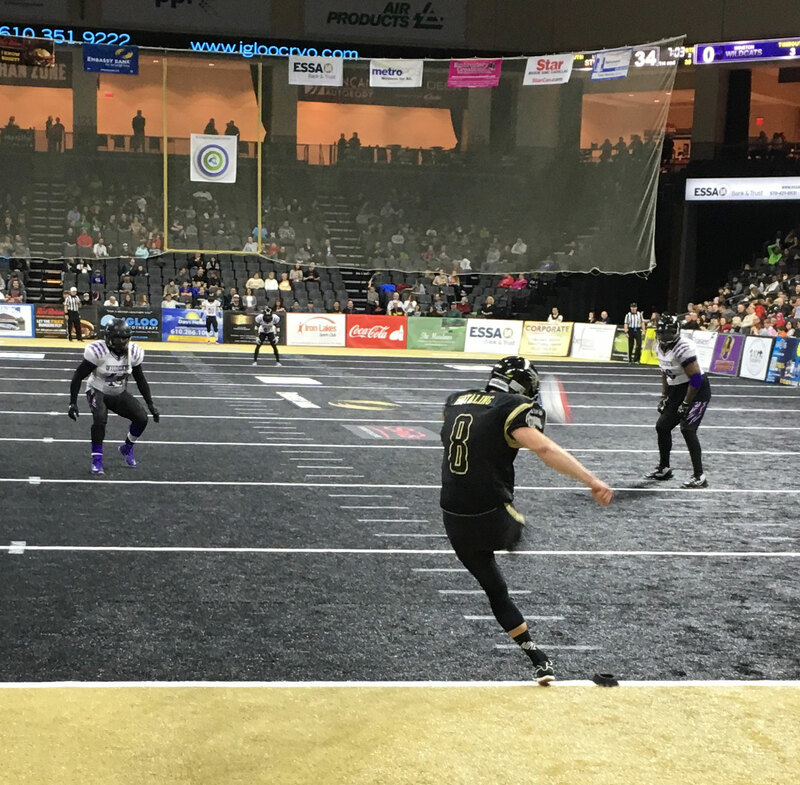 The Steelhawks will continue their five game home stand on April 23rd with a 7:00pm Saturday night kickoff against the Philadelphia Yellow Jackets which is presented by Capital Blue Cross, and is deemed Customer Appreciation Night. The game will feature thunder-sticks given to the first 1,000 fans. It’s not too late to get 2016 flex packs either. Both they and individual game packages to watch the Steelhawks play inside the PPL Center are on sale now. Keep checking for the latest news and events from the Steelhawks. For further information please call Lehigh Valley Steelhawks Executive Vice President and General Manager Mike Clark at (610) 282-3100, or visit our website at www.LVSteelhawks.com for the latest Steelhawks news. Reserve your seat now by calling the Steelhawks office at 610-282-3100. The Steelhawks play all of their home games on Embassy Bank Field inside the PPL Center.